There are many places that you can successfully sell your handcrafted and crocheted items. In this article we will discuss the different venues available as well as the pros and cons of each. I will also give you pointers and tips for selling in each venue. 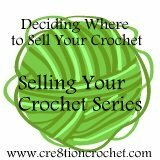 If you have been following along with my Selling Your Crochet Series you will have looked at what type of items you want to make, how you should price them and how to keep guilt and fear from sabotaging your success. There are three major categories where you can sell your crochet work; online, brick and mortar stores and selling in person. Each of these major categories have many different options. We will begin with online sales. There are many different online social commerce sites for selling your handcrafted work. The most popular is Etsy, but there is also ArtFire, Copious, Shopify, and many more. The pros of selling on a social commerce site is that they are very popular, but this can also be a con. Etsy is saturated with crochet vendors. Sites like Artfire and Copious have less crochet but also aren’t as well known. Other pros to selling online is that you get to keep most of your profit, other than the fees there is no commission to be paid to anyone else as there would be in a brick and mortar store. Some cons or other things to consider are, that in order to make sales on Etsy and online stores you NEED good photography. Because there is so much crochet and handcrafted work on these types of stores you really need to stand out from the crowd. There are also fees involved with some of these online venues and they take a lot of time to list your items. Packaging and shipping is another thought to consider when selling online. You’ll need to put money into professional or custom packaging in order to stand apart from the thousands of people selling their handicrafts online (it can be as simple as nice tissue paper, a ribbon and your business card). Shipping can be very expensive, you will definitely want to charge extra for shipping or roll the costs into the price and offer “free” shipping. There are many crochet vendors who have successfully made quite a career out of selling their goods on Etsy. Take a look around at the shops that sell the most. Look at their photography and the quality of their work. All of the best shops have photos that are professional, most feature actual people. Here’s a great list of 10 Online Venues for selling handcrafted goods. I will also be doing an article on tips to selling on Etsy, Copious and Artfire at a later date. There’s Facebook, Google+, Twitter, Instagram and countless other social media sites out there. They can be a great place to get your name out there and sell your crochet work. Facebook is probably the best option at this time. Your listings can be easily shared by your followers, bringing you even more fans. You can also be involved in contests and giveaways that can help you grow your “likes”. The more people you have on your Facebook page, the more sales you are likely to make. Pinterest is a good place to list your sale items. Even if you don’t make actual sales it is a great way to get your name out there and get people to your Etsy, Facebook, Blog, etc. Twitter and Instagram are great places to start promoting your work. It is best if you also list other related information; fashion trends, colorways, popular baby items, etc. People tend to stay away from those who are only promoting the items they sell. The biggest downside to social media sales are that you have to invest a lot of time in order to get the biggest bang for your buck. There is also no check out on these types of sites so you will need to send invoices to your clients through an e-commerce site such as Paypal. Owning your own domain is another option for selling your crochet. There are many free blog options out there on Blogger and WordPress.com. If you continue to grow you can update to a self hosted blog on WordPress.org and use a private host company such as RFE Hosting. You can either set up a Paypal or other e-commerce button directly on your blog or you can invoice clients after they express the desire to purchase. All online sales take a lot of extra time on top of your designing, to list and promote your sale items. There are also fee’s involved; from listing fees to Paypal fees to registering domain names and possibly having a hosting company. You’ll also want to have many various sizes and colors available for purchase. The quicker your turnover time the better. You can also take custom orders through Etsy , Facebook and your own domain. Just like with Etsy, it is best to have many different styles, colors and sizes available. The next option is in Brick and Mortar stores. The list is endless for actual physical locations you can sell your crochet, the following is just a list of places I have sold or have seen crocheted items for sale. 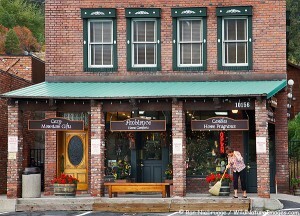 Consignment shops, boutiques, antiques stores, baby clothing shops and even your own storefront are all options for selling in brick and mortar shops. The biggest pro to selling in store is that you don’t have to be there, unless it’s your own store of course. In that case you will need to be in the store or hire someone else to handle sales. There is also a huge amount of overhead that is part of owning your own business, whether you rent or own your own space. The biggest pitfall to selling in retail boutiques is the loss of profit. Some shops will require you to price and tag your own items. Some places will display your items wherever suits them best and some will rent you a booth or space. The stores that place your items in their general stock typically take a commission anywhere between 40-50% of the retail price. The stores that rent you a booth or table typically charge a monthly fee for the space. Either way this money will lower your bottom line. For more detailed information on selling in brick and mortar stores you can check out my article on Selling Your Handcrafted Crochet in Retail Boutiques. Lastly there is an option that requires you do the actual selling in person, or hire someone to do it for you. You’ll need to have confidence in your work and good people skills to pull this one off successfully. There are many different options for self-sales when it comes to selling your work. You can do an Art Show or Craft Fair or even a trunk show. Art shows tend to allow higher prices but are not as well traveled and people tend to look rather than buy, it is a great way to get your name out there though, be sure to have flyers and/or business card available. Craft fairs get lots of foot traffic but the people there are usually looking for low prices and tend to haggle on prices. Customers are there for good deals, as opposed to quality work. However the is always the exception and some vendors do quite well selling at craft fairs. With either option you will want to have an eye pleasing display and a varied selection of items. You can take custom orders but they will be few and far between, people want to take their goods with them. You will need to provide bags or a way for customers to carry their purchases. You may want to look into phone apps that allow you to take credit card payments such as SquareUp. You’ll also need to keep a good amount of change. Keep in mind that this option will take up your whole day, and you may not even make a single sale. There is a lot of set up and prep work with selling in this type of venue. There are usually booth/vendor fees and the weather plays a big part in turn up. I definitely recommend purchasing an easy pop up tent if you plan on doing art shows or craft fairs. There are also vendor fees in most cases. The other option is hosting a trunk show. A “trunk show” is a special type of sale where vendors present their merchandise directly to shop owners or customers at a retail store or another unique venue. You can also do trunk shows at private residences, like you would a Tuppeware party. This type of sales option requires a lot of planning, nice displays and a varied selection of items. It is more common for people to place orders at a home trunk show/party so you may not need as much as you would if you chose to sell at a craft fair. With craft fairs you need to rely on the elements holding up and go by someone else’s schedule. With Trunk shows you have more flexibility with dates and times but need to put the time into the actual scheduling. As you can see there are many options for selling your handcrafted and crochet work. There are many other options not covered in this article but these are the most popular and tend to be the most successful. Each of these options has benefits and drawbacks. You’ll need to take a look at what option is best for you. Do you have the time and flexibility to sell either online or in person or would you do better dropping off your items to a store and letting them handle the sales. Are you willing to lose the money in commissions that need to be paid to the store in exchange for that convenience? Do you have good photography skills or know someone who does and is willing to barter services with you for the photos needed to make online sales. Are you able to go to the post office on a moment’s notice if you make a sale. Do you like dealing with people or are you shy and quiet? Can you take the time on weekends to spend all day waiting for sales. If you are really motivated, you can choose a couple of these methods to sell your work, or even do all three. You can list an item on Etsy, share on Facebook, tweet about it and then bring some items to retail boutiques, occasional craft fairs or trunk shows. Your homework this week is to sit down and write out what option seems best for you. Look at all the pros and cons and decide on one or two ways to go about selling your work. The next step is to research the different venues in each option. Research what is already being sold in those venues. Think about what you can do to stand out in the crowd and set yourself apart from other vendors in the same venues. Like it? Love it? Share it!! You’re continued support allows me to bring you more free crochet patterns, tutorials and crochet business information. Lorene Eppolite is the editor of Cre8tionCrochet.com and Cre8tiveLiving.com. In 2012 she started publishing free crochet patterns on her blog. She has been featured in The Yarn Box, Lion Brand Facebook page, Red Heart Facebook page, The Crochet Crowd and All Free Crochet. She is now the official crochet designer for Darn Good Yarns. She is the host of her own TV show Cre8tion Crochet LIVE- which airs weekly on Wednesdays 9pm EST. Lorene’s mission is to help other crafters find success with their business’. Connect with Lorene on Facebook.